Microsoft is the first cloud container provider to formally announce a new range of VMs based on the AMD EPYC platform. These VMs will be called the Lv2 Series, varying from 8 cores to 64 cores, and offering substantial DRAM and storage capabilities. 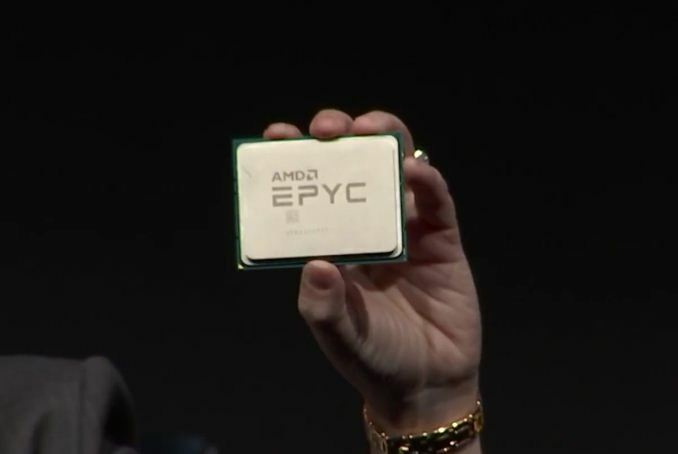 Back at the launch of EPYC, most of the major cloud providers had expressed interest in pursuing the capabilities of the new CPU for deployment in their cloud and to customers. At that time, the major statement was that the cloud providers were in the process of ascertaining the suitability for large-scale deployment, and optimizing the implementation to best suit them and the customers. Several months have passed, and Microsoft is the first to make the jump. Interested parties can, from today, sign up for a preview of the EPYC-based series. In Azure-speak, the L series of VMs are focused primarily on storage, with a nod also to CPU compute and memory. With 128 PCIe lanes available, there is the opportunity to get some really fast storage out of an EPYC platform, as well as large in-memory applications. In the press release today, it is stated that the 8-to-64 core VMs available will be targeting database applications, with NoSQL up on that list as well as a view towards Apache Spark (AMD recently released framework guidelines for Apache Spark on EPYC). We asked several questions about the deployment, such as the Azure locations that will be EPYC enabled as well as which EPYC-specific security features are in use on the Azure platforms. Deployments in specific datacenters are not being discussed at this time, and the SME features of EPYC are not being used in Lv2. The servers will be based on the Microsoft Olympus platform, to which AMD demonstrated several system versions earlier this year, and is part of the Open Compute Platform project. The current series of VMs available are not GPU accelerated, however the Olympus platforms for EPYC can support GPU add-in-cards, so this could be a potential Azure product in the future. The servers currently available will be dual socket designs, using AMD’s EPYC 7551 processor, with 32-cores, a base frequency of 2.2 GHz and a single core turbo of 3.0 GHz. We suspect the use of 7551 was ultimately more cost/power effective over the 7601. The highest-capacity VM will be supported with up to 4 TB of memory, and support Azure premium storage disks by default with accelerated networking capabilities (not explained if 10 GbE or Infiniband or other). The VM types we were given only constitute the initial offering for now, with the 4 TB offering likely to come later. AMD states that they will have other Cloud-related deployment news before the end of the year. Don't tell me Costco raised the price of their hot dogs! That was the only reason why I even went there in the first place. What part of "Azure" and "VM" suggest that they are going into server hardware?